Practical, effective guide for people looking to break into the world of writing online and for experienced writers who want to know how to add online freelancing to their portfolio of services. The Market for Online Writers is Wide Open. But to Succeed It Takes Resilience, Creative Thinking and a Solid Plan. As an online freelance writer, can you really… Work from home and set your own schedule? Build an active list of loyal clients who are located around the world? Become known for a specific, in-demand niche that has customers clamoring for your services? Realize virtually unlimited income from a variety of sources? Yes, all this and much more! 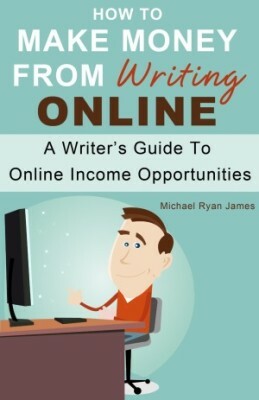 How To Make Money From Writing Online by Michael Ryan James is a practical, effective guide for people looking to break into the world of writing online and for experienced writers who want to know how to add online freelancing to their portfolio of services. Inside How To Make Money From Writing Online you will learn: How to distinguish yourself from the competition by tapping into what makes your approach to freelance writing unique and valuable. Tips and examples for setting up your work space, creating a schedule and managing your time to maximize your productivity and profitability. Ways to uncover hidden markets and a variety of income streams that will help your online writing business thrive. Strategies for attracting and keeping more clients. Secrets of delivering outstanding customer service. Pricing strategies to make sure you get paid what you’re worth. And much more. The market for online freelance writers is exploding. And the writers who succeed are those who commit to delivering outstanding results for the clients. How To Make Money From Writing Online details how you can set yourself apart from the crowd and build a lasting career as an online freelance writer quickly and effectively.